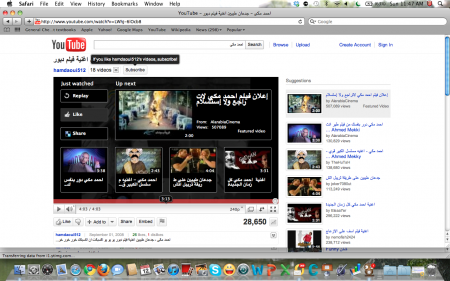 It appears that Adobe has finally fixed Arabic support on Mac in the beta version of Flash 10.2. Previously the developer of the individual swf file needs to add Arabic support manually, sites such as YouTube simply did not add that. Adobe might be late to add Arabic support but it’s better than none. Hopefully Adobe AIR will do the same. Here’s a screenshot of Youtube with Flash 10.2 beta. Thanks Ali for sharing it. Flash 10.2 beta is available on Adobe’s website. For Google Chrome users: Flash is bundled with Chrome so you will need to follow these instructions to use Flash 10.2 beta with Chrome.